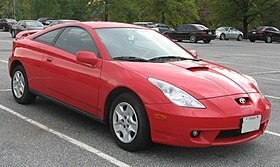 The Toyota Celica name has been applied to a series of coupes made by the Japanese company Toyota. The name is ultimately derived from the Latin word coelica meaning “heavenly” or “celestial”. In Japan, the Celica was exclusive to Toyota Japanese dealerships Toyota Corolla Store. Throughout its life span the Celica has been powered by various four-cylinder engines. The most significant change occurred in August 1985, when the car’s drive layout was changed from rear wheel drive to front wheel drive. During the first three generations, American market Celicas were powered by various versions of Toyota’s R series engines. The four-wheel drive turbocharged model (designated All-trac in the United States or GT-Four elsewhere) was produced from 1986 to 1999. Variable Valve Timing came in late 1997 Japanese models, and became standard in all models from 2000 on. Through seven generations, the model has gone through many revisions and design forks, including the Toyota Celica Supra (later known as the Toyota Supra). The Celica was available as notchback and liftback coupes, as well as a convertible.